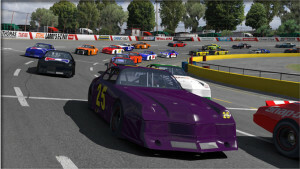 In iRacing, you will start off with a rookie license. You will be racing with Rookie and Class D drivers. In order to move up in the classes (upgrade your license), you have to improve your Safety Rating (SR). The only way to do that is to run consistently clean laps in official sessions like time trials, qualifying, and races. The key to success is patience. Don’t get in a hurry. Start off with test sessions. Test sessions won’t help or hurt your safety rating, and you’ll be alone on the track. When you can turn at least 20 fairly consistent laps with no incidents (don’t hit anything, don’t spin, don’t run off course), then you’re ready for a practice session. Practice sessions also won’t affect your safety rating, but there will be other drivers on the track. Continue to practice and test, and when you feel pretty comfortable and can turn many laps without incident, go for your first time trial session. In time trials, you’re alone on the track. Time trials will affect your safety rating, so be very patient and run all clean laps if you can, with no incidents. From there, move on to qualifying and racing as you feel comfortable with them. To learn more about Safety Rating and the different licenses, have a look at the FIRST Sporting Code. One thing that seems to help me a lot is to watch replays during or after practice sessions. Go to the replay screen and find a driver who turns some pretty good laps. Watch his or her replay. You probably won’t be able to do what the other driver is doing right off, but you can get an idea about what he or she is doing that is making the car go fast. You can try to practice with that in mind. I’m an oval racer and I really like the short tracks. The way to go faster on those tracks is to drive deeper into the corner, and get on the throttle earlier coming out of the corner. It sounds easy when I say it that way, but it’s much harder than it sounds. You have to do those things yet keep your entry and exit smooth and consistent. Another thing that I had read about but only recently tried is ghost driving. You can join a race and drive as a “ghost driver.” Other drivers in the race will never even know you’re there. If you mess up, you can’t mess them up, and vice versa. To try ghost driving, from the iRacing member page, mouse over EVENTS in the menu, then click Watch / Ghost Drive / Spot. You’ll be presented with a page that shows several different types of sessions. Find one for which you are eligible, and click the green icon to the right to join the session. After the simulator loads, you can simply spectate, or you can click Test Drive to join the race as a ghost driver. It’s a great way to race without being too concerned if you make a mistake, and I think it’s a great learning tool that iRacing offers. Another thing that might be helpful is the iRacing.com Driving School. There is a lot of information in this series of videos. Some of it you may already know, as I did, but I also learned some new things that helped me, so it is worth watching. I hope these tips help new racers. I plan more articles in this series in the near future.